1Password 7.2.576, installed 8/24, on Windows 10 laptop.I should have 2 images attached to this email. One is from msinfo32 describing my system info, and the second is the windows application event log showing the crash details. The issue is that 1Password7 worked fine until I applied a windows update, shown below. I haven't been able to get the desktop app to work since. I do have the Firefox browser addon working just fine. That is what is what I'm using for now when I have to use the laptop. 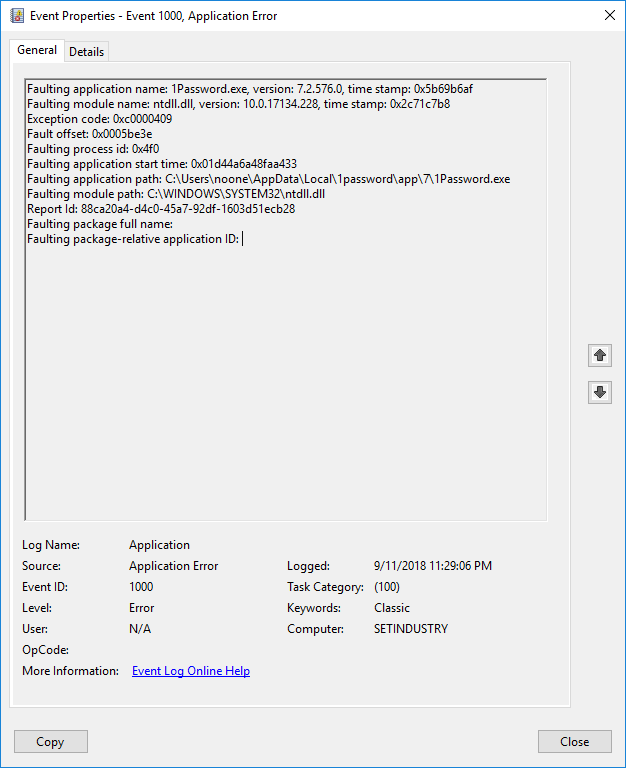 We need the .NET error that follows after the 1Password.exe error in the Event Viewer, the error isn't from 1Password but Microsoft's .NET runtime on your Windows PC. Windows 10 updates have .NET updates built in, so that could explain why this started after the update was installed. Instead of the screenshot of the .NET error in Event Viewer, you can right-click on the error to select Copy > Copy details as text and paste it here. After that, try to uninstall 1Password and then install a fresh copy from here: https://1Password.com/downloads/ to see if that'll help. Uninstalling from Apps & Features list will not remove your 1Password data. You got it ... I got it and then reinstalled, same version, same error. For grins I'll uninstall that and see what's up. Thanks for the help. Uninstalling that didn't fix anything. Lot's of windows updates coming through now, I'll try the app again after they're done. I don't see any .NET errors in your log, did you select the .NET source right under 1Password? If you have a lot of Windows updates, then that may be the issue. We've seen crashes because of incomplete updates that is resolved when all updates are finished. We're not sure why it happens but hopefully, it is the case here for you. I don't see any options to select any .NET source. The only thing after the 1pass error is the windows error reporting notice. I'll grab the .wer report. I had 3 updates, including the one that I uninstalled. I'm running sfc to verify integrity. I'll run dism and see if that finds anything too. I'm seriously contemplating resetting the darn thing. Interesting, I didn't notice it before as I haven't run it in a while, but Acrobat Reader DC also crashes with the same fault. What's more interesting is that you didn't see .NET error. 1Password runs on .NET, .NET loads first and the last to exit the crash, meaning they should always be there to capture the crash report. Try to look at your Reliability History, see if there were any other updates that were installed. 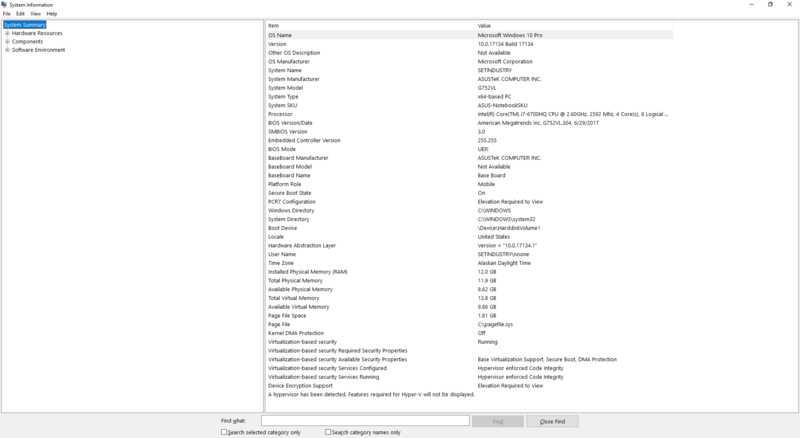 Open the Start menu and search for Reliability History to open it. See if there are other internal crashes you may not be seeing. If you see a lot of crashes, it is possible you may want to revert back to a system point created before the last update that worked fine. And there's absolutely no other place it would report .NET errors? As far as we know, it would go straight to Event Viewer. The last option is to try moving out your 1Password folder. See if 1Password opens up without crashing. If yes, switch back to Firefox and scroll down to step 2 to find the blue Add your account details button, click it and 1Password should open up waiting for you to enter the master password. Well quite a bit has happened. It was certainly strange the way that both AdobeAcrobat Reader DC and 1Password quit working with similar winnt.dll seg faults. For a time I simply ran 1PasswordX on my laptop (win 10). It's worked flawless on the Mac. So yesterday I had something happen that took me by surprise, apparently my laptop has been totally compromised. I've got a persistent connectcion to a 172.19.x.x, private LAN. So I've been spending the better part of my day backing up all my files and I opened up a PDF and Adobe Acrobat fired up... so I was like, well no kidding, and tried 1Password. It has miraculously healed itself and runs like a charm now on my laptop. Hilarious. I upgraded to the latest. I know my payment is late, taken care of by later this evening. Close my case, all is well. Thanks a ton to you guys for holding me up for a bit. PS. the only logs I have are the main log (which started today, I don't think 1PasswordX uses that location) and the setup from the upgrading. I can email them if wanted? 1Password blew up, I think the ghost in my machine tried to run a train on .Net, pretty sure he was trying to inject his own clr.dll. I got the .Net error in the application log this time. Post that first, then it's HitmanPro that debugged the breakin.Anywayhs, hope this helps. I'm rebuilding the laptop so I'll start fresh in a few days. "C:\Program Files (x86)\Google\Chrome\Application\chrome.exe" -- "https://home.sophos.com/"
I ran this problem down quite a bit. I ended up resetting my laptop to a fresh install, not trusting what was on it. I got Win10 installed and got the standalone 1Pass working great... until I installed firefox and allowed it to sync my profile. Boom, same anonymous clr.dll attempting to inject. I uninstalled it and system is running fine. Jeez. I hope so too. Thanks for the update. I'm not sure how Firefox could sync a DLL, and from what I understand clr.dll is part of .Net Framework anyway. Hopefully it will be smooth sailing for you from now on! Did you have Sophos extension installed in Firefox before? Sophos dislike 1Password's .NET JIT process, it'd block it by default as it flags it as a false positive, thinking it is infected with CallerCheck. Mike, It's setigamer, I'm pretty sure I tried excluding the 1Password folder from Sophos. That said, I had to wipe all my systems this week. My Authy backup decryption password is inside my vault but I have 2-Factor auth enabled on 1Password. Is there a way to disable that so I can get in? I had to create a new user as my forum password for vkhanson is also in the vault . Is there no single authorized device you can use that hasn't been reset, like an iPhone or Android device? Do you still have access to your original email address you used to sign up for 1Password? The point of 2FA was to make it very difficult to get into the account and we don't have an easy button to reset it, it's not within our powers to do so. With that said, we can try to help you figure out a way to recover your access. Please reach out to us at [email protected]. It's hard to describe, Mike, 2 weeks ago I realized someone was on my windows laptop (where 1passwd kept crashing). Full admin privs, by the time I found out they had me. Win10Pro with Sophos, then Mac OS X 10.13.6, and then my android cell phone. The forensics I managed to dig up before they deleted all their work was just shy of miraculous. I've already recovered my windows and google array of accounts, so easier to just set up a new vault. How about you reset my account and turn off that 2-FA so I can start fresh?